Huddersfield Schools ‘Take a Break’ for Fairtrade Fortnight! The Creative Media and Studio School opened its doors for the 3rd year running to 10 schools from across Kirklees on Friday 3rd March, to celebrate Fairtrade Fortnight at the fairandfunky Fairtrade Conference. And he is right! Buying Fairtrade IS a way in which we can all change the world, and the conference engaged everyone in four different workshops from Pockets Theatre, fairandfunky, Bala Sport and Couer De Xocolat, to discover more. In the Bala Sports workshop students discovered that Fairtrade isn’t just about food! Through videos and presentations students entered a world of football – meeting the workers in Pakistan making Fairtrade Footballs and discovering how important Fairtrade is to their communities. Each student then found out just how difficult it is to make a football! In the ever popular chocolate workshop from Coeur de Xocolat, students headed to Ghana to discover all about the journey of chocolate from bean to bar. “Very informative and very interactive!” Teacher feedback. Delegates watched a video about life as a cocoa farmer and took part in a chocolate tasting session using all five of their senses! With Pockets Theatre delegates took on different roles within the supply chain of chocolate to create ‘Fair’ and ‘Unfair’ dramatic poses. Students considered how these made them feel, and how Fairtrade empowers producers and consumers! 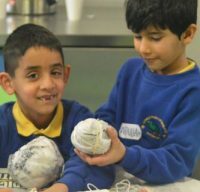 “Children really enjoyed learning about Fairtrade in fascinating workshops.” Teacher feedback. During the fairandfunky workshop students discovered there are 4,500 products with the Fairtrade mark! From cotton to gold, herbs and spices, cola and fruit bars, footballs and toys; there is so much more to Fairtrade than coffee and bananas. Each child created a Fairtrade flag, to fly the flag for Fairtrade and carry the Fairtrade message out of conference to school, at home and beyond! After lunch (which included delicious Fairtrade juice from Natural Beverages!) students were treated to a presentation from Conference Champion Sponsors Suma Wholefoods, who shared how important Fairtrade is to their business and to their customers. “Knowledge learnt today will be taken back to school to inform others! Such a fun day.” Teacher feedback. The Conference closed with certificate presentations to every school from Jason McCartney MP; who also told students about his role as Co-Chair of the Fairtrade APPG in Parliament.